"THE STATISTICS COVER EVERYTHING I NEED TO KNOW"
"SMART AND GREAT TO HANDLE"
"SO EASY - EVEN DAD CAN DO IT"
"I FEEL FIT AS A FIDDLE"
"I WANT TO STAY FIT INTO OLD AGE!" "LIVING A SIMPLE LIFE WITH DIABETES"
"CONTROL YOUR DIABETES WITH SIDIARY"
With our diabetes-management-software-SiDiary you can easily import data from your Omron 1500 Pro blood pressure meter and use lots of advantages of statistical analysis, trend analysis and graphics to improve your therapy together with your doctor. If you plan to replace your device to another blood pressure meter from Omron in the future, the data transfer from the aboved named devices are immediately available for you. In your Bi-Link account you can export the data into in an export file. Then in SiDiary you can select this file and import it into your logbook. 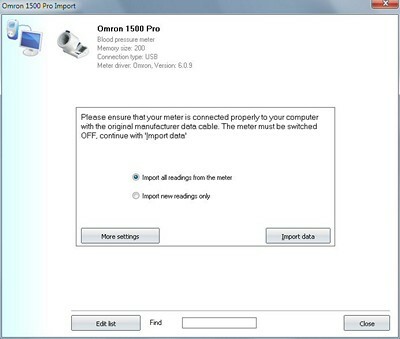 Here you can find the manufacturer website where you can download the Omron Health Management Software (OHMS).